Sanford has a new Library in town that just opened on Monday, June 26 at East Side Acres on Bates Street. It is a "Little Free Library," (LFL) part of a Sanford-Springvale Rotary Club project in collaboration with Goodall Memorial Library. The concept is "take a book and return a book." Sanford Rotarian, Shawn Babine learned about the program through the Scarborough Rotary Club, which has placed a number of LFLs in Scarborough neighborhoods. Shawn broached the idea with the Sanford-Springvale Club which jumped at the chance to undertake the project because supporting literacy is one of the Rotary's priorities. Looking for a community partner, Shawn approached the Goodall Memorial Library and Director Jackie McDougal enthusiastically agreed to collaborate on the project. Bill Keefer, Executive Director of the Sanford Housing Authority was asked if East Side Acres could be the site of the first Little Free Library and he quickly and happily agreed. The first library was built by Rotarian Neal Meltzer, the Director of Waban and a skilled carpenter, and it was beautifully painted and decorated by East Side Acres children. 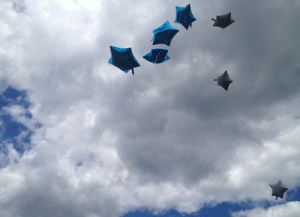 A grand opening ceremony was held at East Side Acres on Monday. Rotary President Barbara Sutcliffe and Goodall Director McDougal spoke of the importance of the collaboration between the club and the library and how they were looking forward to future LFL installations in Sanford. Keefer expressed his pleasure at being the site of the first library and talked about the importance of reading and how much it meant to him. 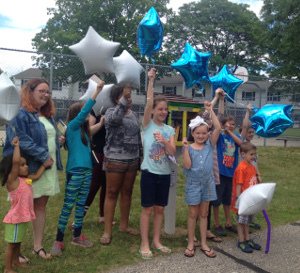 Many parents and the children who decorated the library were present, and in lieu of a ribbon cutting balloons were released. 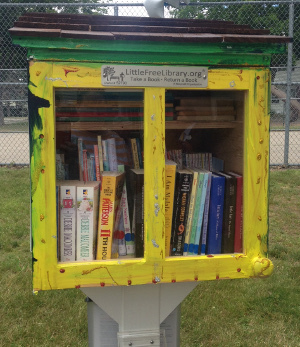 Little Free Libraries is a national program operating in many communities all across the country. 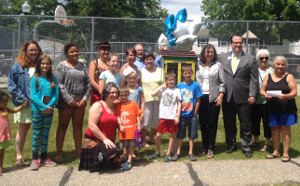 Most LFLs, including this new one in Sanford, are registered with the Little Free Library national organization. A photograph of the library and its story appear on a world map on the organization's website. There are hundreds of different library designs, some simple and others quite elaborate. Rotarian Elias Thomas while attending a conference in Washington, DC was taking a walk through a neighborhood and came across one in a homeowner's front yard. One of the great things about this library is that it is open twenty four hours, seven days a week, and every day of the year. It will have books for children, young adults, and adults and will include fiction and non-fiction. People wishing to donate books can do so through a Rotarian or the Goodall Memorial Library. Rotary and Goodall Library are planning to build and place more of the Little Free Libraries at different locations around Sanford and Springvale. Keep your eye out as one may be coming to your neighborhood. For more information contact Shawn Babine at 207-274-0805 or Jackie McDougal at 207-324-4714.